The protagonist releases the troubled horse from war service because he has seen too much already. Later on, when the injured hero is found by that same grateful horse and revived, he still has a halter on his face and now also a rope attached to it! Apparently, that's how he was set loose into retirement. I especially love it when the Fearless Leader characters are riding around holding on to the horn and reins as tight as possible, with toes shoved as far down as they'll go. Last edited by KLJcowgirl; 05-12-2017 at 06:38 PM. Bad horsemanship in movies, 99.9% of it, only person that could ride decently in a movie, actually was a mini series, was the late Patrick Swayze in The North and the South. I miss that guy. AnitaAnne and AndalusianRobyn like this. Flicka, I hate watching her canter! Looks like she is jerking the horse's mouth with every stride. KLJcowgirl, Colby Jack Seige and mmshiro like this. 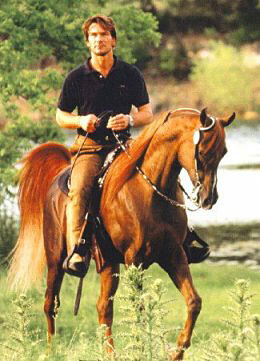 Well, Patrick Swayze owned Arabians, so of course he could ride! That's my bias, LOL. In Snow White and the Huntsman, Kristen Stewart has this riding scene where she's going along bridleless and then you can see her hands jerking around obviously holding reins that have been removed by CGI. What bugs me the most is when they trade horses several times in one scene, and the horse is wearing a bitless bridle and suddenly there is a bit in his mouth, then he has a blaze, then a star, but supposedly the same rider just rode the horse along a trail for five minutes. AnitaAnne, waresbear, secuono and 10 others like this. I get a chuckle when the movie star is about to mount the horse, there is always some creative filming to avoid watching the actual mount as I'm sure it is quite awkward. waresbear, KLJcowgirl, EightAndAce and 1 others like this. I also "like" when there is an obvious stunt rider... Haha main character takes off flapping their arms, kicking way to hard, and flopping all over... Pan out to horse and rider galloping flawlessly across the open plains or executing a world class jump. AnitaAnne, Woodhaven, Hubble and 2 others like this. Ok! I thought of something... sorry to post so much. It's not really bad horsemanship per se but still, involves a horse and a man. AnitaAnne, HombresArablegacy, Change and 4 others like this. I had an early 1990's horse magazine with Patrick on the cover on his Arab, I should have kept it, dang it! He had an Arab ranch and he & his wife showed Arabs, and they had another ranch in Texas with quarter horses and a TWH, he liked to rope, if wife liked to trail ride. I am getting all teary eyed now. AnitaAnne, phantomhorse13, Celeste and 6 others like this.